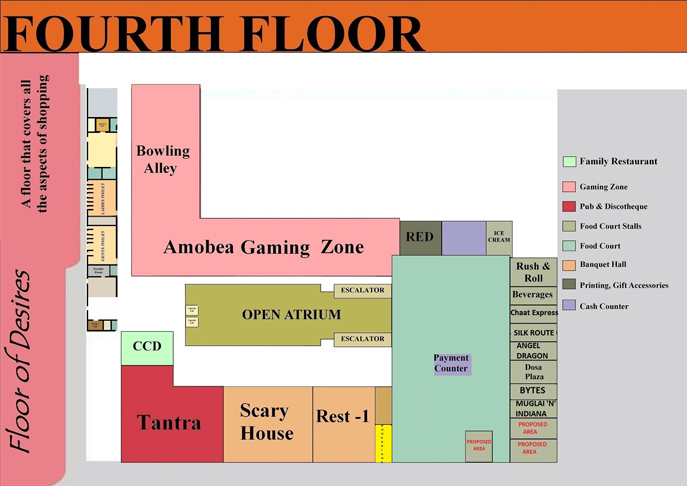 Amoeba: Best gaming zone ever! Rush inn roll is a food court. Chaat Express is a Food's Junction. "Silk Route" With Assorted Cuisines From All Over The World. With 10 years of expertise in serving delicious and yummy variations of Dosas. Bytes-the food court providing varied cuisines under the same roof. Food court serving Mughlai cuisines and more..
Tantra Pub & Lounge serves Thai, Italian, Chinese, North Indian, Continental. Scary House - House of Horror. CCD india's favourite coffee shop offers cappuccino, hot coffee, cold coffee and much more..